All donated cups will be considered for the NCECA “Cups of Merit” Commission Award, was established 9 years ago to recognize outstanding craftsmanship and artistic merit among the generous donors to NCECA’s Annual Cup Sale. Each year NCECA appoints a small panel of three distinguished ceramic artists to make merit awards from the cups submitted to the Annual show. Jurors will make purchase awards totaling up to $1000 to three or more makers included in the Cup Sale. (Each award will be of an amount sufficient for NCECA to purchase two or more cups based on the pricing presented to the sale administrator.) NCECA will retain cups in its collection for as long as a time as it is practical. Cups may be periodically removed from the collection to recognize individuals for outstanding service or generosity to NCECA. Then, on Friday, at 8:00am, you have the opportunity to build your own collection by purchasing these amazing cups while also helping to build the NCECA Fund for Artistic Development. This fund provides opportunities for artistic growth through scholarships, residencies and programs including the Regina Brown Undergraduate Fellowship. Purchases are limited to three cups. Cups will be on sale until they are sold out. The Rhode Island Community Food Bank is celebrating the 25thanniversary of Empty Bowls by hosting an event on Friday, March 27th from 5:30-8:30 at Rhodes on the Pawtuxet in Cranston. o Or dropped off during the NCECA Conference at the Salve Regina University table in the non-profit section. Tickets are open to the public and are $35 for general admission and $150 for patron tickets. They go on sale beginning the week of February 25. Click here for tickets! 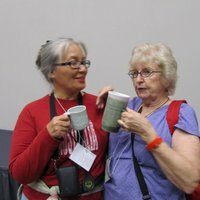 The Exchange is open to all members of the Clayart Internet Discussion Group attending NCECA. Pick a mug, or another ceramic object you’ve made, for the exchange. Only one item please. Since all the pieces will be put in bags for the exchange, your piece must fit in a paper bag measuring approximately 5″ x 4″ x 9″. Please place your business card or a handwritten card with your name and contact information inside the mug. It would be wonderful if you would include technical information on the card about the mug, such as construction method, firing temperature, and glazes used. Bring your mug to the Clayart room any time before the exchange is scheduled and place it on the designated table. The sooner the better, as we all love looking at the mug exhibit during the conference. The most recent addition to the list of pottery swapportunities comes from the Facebook group Clay Buddies! The date will be Thursday March 26th, at 5:00pm at the Metro Café, located on the 3rd floor of the Conference Center. The only requiremts are to bring 5 Shot Glasses or more, made by you with loving care, to be exchanged with multiple Clay Buddies. The more the merrier!! Click here to check out and join this group, for more information, contact Dana Drake, the coordinator of this event. …I wonder why there are no plate trades…..? Well, maybe next year. Can you please change the date of the ClayBuddies Shotglass exchange to Thursday March 26? Time to be announced on Claybuddies. I am organizing this. Had to change the date so some of the vendors could participate. Thanks, Dana, for letting us know!